Cuba’s recent energy revolution has helped it become a true model of sustainable development. The 2006 Living Planet report assesses sustainable development by using the United Nation’s Development Program’s (UNDP) Human Development Index (HDI) and the ecological footprint. The HDI is calculated from life expectancy, literacy and education, and per capita GDP. The UNDP considers an HDI value of more than 0.8 to be high human development. An ecological footprint, which is a measure of demand on the biosphere, lower than 1.8 global hectares per head denotes sustainability. The only country in the world that meets both of the above criteria is Cuba. "Cuba has reached a good level of development according to United Nations’ criteria, thanks to its high literacy level and very high life expectancy", explains Jonathan Loh, one of the authors of the report, adding: "While the ecological footprint is not large since it is a country with low energy consumption." The statistics are impressive, the country is currently consuming 34% of the kerosene, 40% of the liquefied petroleum gas(LPG) and 80% of the petroluem (gasoline) it used to consume before the implementation of the energy revolution a mere two years earlier. Cuba's per capita energy consumption is now at a level one-eighth of that in the US, while access to health services, education levels, and life expectancy are still some of the top ranking in the world. How does a country with a per capita GDP one-tenth that of the US, have the resources to carry out such a radical change in energy consumption, without sacrificing their high social indicators in health and education? To understand Cuba's energy revolution one must understand some of the history of energy production and consumption in Cuba. Prior to the 1959 Cuban Revolution, 56% of the country was electrified. With the socialist revolution came a push to electrify even the remotest communities. By 1989, 95% of the country was electrified –- mostly with cheap oil traded for sugar with the Soviet Union. The collapse of the Soviet Union in 1991 caused the bottom to fall out of the Cuban economy. Having to buy oil on the world market meant that cheap electricity was a thing of the past. Food, petrol and oil all became scarce as the US made matters worse by tightening its economic blockade. Both the 1992 Cuba Democracy Act and Helms-Burton law passed in 1996, target foreign investment in Cuba, seeking to undermine Cuba's international access to capital, and making much needed resources hard to come by. The years following the Soviet collapse and the intensifying of the blockade were known as the "Special Period" because Cubans had to tighten their belts and learn how to produce basic requirements such as food, medicines and energy, both locally and sustainably. In 1993, a National Energy Sources Development Program (Programa de desarrollo de las Fuentes Nacionales de Energia) was implemented to reduce Cuba's energy imports and obtain maximum benefits from domestic energy sources. The document proposed that the first national source of energy should be efficiency. After the National Energy Sources Development Program was adopted, Cuba embarked on a drive to save energy and use more renewable sources of energy. All rural schools, health clinics and social centres in the country, not previously connected to the grid, were electrified with solar energy, and today 2,364 of the solar electric systems on the island are on rural schools. Making lights, computers and educational television programs accessible to every schoolchild in the country; this program won Cuba the Global 500 award from the United Nations in 2001. However, despite all their efforts, 10 years after the program was implemented, Cuba still had an energy crisis on its hands. So in 2006 the energy revolution took some of the most drastic steps any country has taken to date. Cuba's energy revolution has five main aspects: energy efficiency and conservation; increasing the availability and reliability of the national electric grid; incorporating more renewable energy technologies into their energy portfolio; increasing the exploration and production of local oil and gas; and international co-operation. Understanding that the first step in an energy revolution is not to look for more ways of generating energy, but to decrease energy demand, Cuba began a program to change over to energy efficient appliances. As then-President Fidel Castro explained in a May 2006 address to the Cuban Electric Utility company (UNE): "We are not waiting for fuel to fall from the sky, because we have discovered, fortunately, something much more important – energy conservation, which is like finding a great oil deposit." The program to allow people to switch their incandescent bulbs to more efficient compact fluorescents, free of charge, was met with complete success. In six months more than 9 million incandescent light bulbs were replaced with more efficient alternatives. As there were already many compact fluorescents installed, this meant that close to 100% of the bulbs used in the whole country had been changed to compact fluorescents – making Cuba the first country in the world to completely eliminate inefficient tungsten filament lighting. Furthermore, millions of energy efficient appliances were sold to Cuban consumers, including almost 2 million refrigerators, over 1 million fans, 182,000 air conditioners and 260,000 water pumps. At the same time, efficient electrical cooking appliances were introduced. Almost 3.5 million rice cookers and more than 3 million pressure cookers were sold to families in the push to have people switch from kerosene to cooking with electricity. And one of the best ways Cuba managed to encourage conservation was its new residential electrical tariff structure. Prior to 2006, Cuba's highly subsidised electricity was sold very cheaply, which did not encourage conservation. The new tariff structure allows people consuming less than 100 kWh per month to stay at the current extremely low rate of only 0.09 pesos/kWh (0.38 US cents/kWh). But for every increase of 50 kWh per month the rate skyrockets. And consumers using over 300 kWh per month must pay 1.30 pesos/kWh (5.4 US cents/kWh). In terms of US dollars, this is still significantly less than consumers pay in the United States, but it is over four times what large energy users were paying previously. Cuba also embarked on energy savings measures in the state sector. All water pumps in tall buildings and aqueducts were changed to efficient pumps. The 40 W fluorescent tubes used in many government offices will be changed to 32 W bulbs with electronic ballasts, and inefficient refrigerators and air conditioners have been replaced with more efficient models. A revolution cannot truly be called revolutionary without the support of the masses. 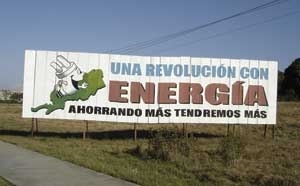 Cuba's energy revolution is no exception. In order to involve the general populace in the effort to save energy, an ambitious energy education initiative was put into place. The Programa de Ahorro de Energia por la Ministro de Educacion (PAEME) is a national energy program implemented by the ministry of education in 1997. Its objective is to teach students, workers, families and communities about energy-saving measures and renewable sources of energy. In schools, the energy theme is present in many different disciplines. Students learn about energy issues not just in physics but in economic classes, environmental courses and health curricula as well. PAEME has also held energy festivals for the past three years, educating thousands of Cubans about efficiency and conservation. The festivals are targeted towards students and are filled with young children expressing their thoughts on energy savings through songs, poetry and theatre. It starts in each Cuban school where the children with the best energy efficiency projects go on to the festival at the municipality level. Then the best move on to the provincial level, and from there on to the national level. "UNE decided that the festival is not a typical competition, but something like an energy efficiency carnival, with the most outstanding students of the country", explains Teresa Palenzuela, a specialist with UNE. In the national festival, where the public lines up for blocks to enter, the students exchange experiences and share knowledge without declaring any winners. In order to get the word out to even more of the population, the mass media was employed. For instance, you never see advertising for commercial products on Cuban highways, instead scattered across the country are dozens of billboards promoting energy conservation. There is also a weekly television show dedicated to energy issues, and articles appear weekly in national newspapers espousing renewable energy, efficiency and conservation. In 2007 alone there were more than 8,000 articles and TV spots dedicated to energy efficiency issues. Despite these efforts, saving energy was not enough, and in 2005 blackouts were still common. Furthermore, Cuba had a very old and inefficient electrical distribution grid to deal with. The Cuban government realised that one of the best ways to provide for energy security was to move towards decentralised energy, and thus it began the move towards distributed generation. Employing this concept means less vulnerability to natural disasters or foreign invasions which might affect electricity to a whole section of the country. The strategy also diversifies energy sources, while making it easier to ultimately change to alternative sources of energy in the future, such as those produced more locally and sustainably. In 2006, Cuba installed 1,854 diesel and fuel oil micro-electrical plants across the country, representing more than 3,000 MW of decentralised power in 110 municipalities. This virtually eliminated the blackouts that plagued Cuba in 2004. In fact, in the years 2004 and 2005 there were more than 400 days of blackouts greater than 100 MW that lasted at least an hour. In 2006 and 2007, there were three, all of which were in 2006. This is a better rate than in most industrialised countries. In addition to the new plants, they also installed more than 4,000 emergency back-up systems in critical areas like hospitals, food production centres, schools and other sites key to Cuba's economy. This represents 500 MW of emergency back-up power. Furthermore, Cuba embarked on an impressive plan to fix its existing electrical transmission network. It upgraded more than 120,000 electrical posts, over 1 million utility service entrances, almost 3,000 kilometres of cable and half a million electrical meters. The overall effect of this program meant that in 2005, while the country needed an average of 280 grams of oil to generate one kWh of electricity, in 2007 this figure had fallen to 271 grams of oil per kWh. While this might seem like a small saving, it translates to thousands of tonnes of imported oil annually. In 2006–2007 Cuba saved over 961,000 tonnes of imported oil through its energy saving measures. Although incorporating renewable sources of energy into the energy mix has been a priority since the early 1990s, the past two years have seen even more growth. Currently 100 wind measuring stations are being installed in 11 different provinces of the country and two new wind farms have been built, bringing the total wind energy installed in the country to 7.23 MW. Also in development is the country’s first grid-connected 100 kW solar electric plant. Furthermore, 180 micro-hydro systems, harnessing energy from water in streams and rivers, are installed around Cuba, 31 of which are grid connected. And the number of independent solar electric systems in rural areas of the country has risen to more than 8,000, with a plan in place to use solar panels and other renewable technologies to electrify the remaining 100,000 houses that don't yet have access to electricity. This year will also see the addition of 300 biogas plants, which are using animal waste to create cooking fuel. Sugar, Cuba's main export crop, also produces electricity. In sugarcane factories around the country the bagasse, which is the residue left over after the cane is processed, is burned and turned into useable energy to power the plant and to feed the electrical grid. Sugarcane biomass facilities currently have an installed capacity of 478.5 MW. Cuba is also making progress on liquid biofuels such as ethanol. Usually involving the use of food crops like corn, the official stance on biofuels is that "Cuba does not support the idea of converting food into fuels, while more than 800 million people suffer hunger". Nevertheless, there are some liquid biofuel pilot projects. The best example is the cultivation of Jatropha Carcus, which produces a non-edible oil, and which thus does not compete with human food production. In 2007 a national group aimed at supporting and promoting the accelerated development and penetration of renewable sources of energy and energy efficiency was created. The 14 commissions of this group, covering all types of renewable sources of energy and efficiency, have a government mandate to study better ways to introduce renewable energies into the country. The island has exported its energy revolution to other countries as well, in the framework of the Bolivarian Alternative for the Americas (ALBA), an alternative to the Free Trade Area of the Americas (FTAA). ALBA emphasises the fight against poverty and social exclusion. For instance, after Cuba worked with Venezuela on an energy-conservation campaign, Venezuela reported savings of 2,000 MW of power. Cuban scientists and technicians have also provided and installed over 1 MW of solar electric panels in Venezuela, Bolivia, Honduras, South Africa, Mali and Lesotho. To carry out their ambitious energy conservation plan, Cuba relied on its small army of trabajadores sociales or social workers. Formed in 2,000, Cuba's social workers are made up of youths who have the task of bringing social justice to the island in many different spheres, including labour, education, culture, sports and the environment. Along with working with people with disabilities, the elderly and people convicted of crimes, the latest job of the social workers is to help carry out the energy revolution. Since 2006, 13,000 social workers have visited homes, businesses and factories around the island replacing light bulbs, teaching people how to use their new electric cooking appliances and spreading information on saving energy. The social workers also worked with the ministry of agriculture to help save energy in the sugarcane harvest, and work in the transportation sector to achieve more efficiency in the national bus system. The social workers attend a school where they receive classes in politics, social communication, energy and sustainable development, with the objective of creating values and convictions which should characterise a social worker. They are also taught to replace light bulbs and to explain the need for saving energy. Furthermore, under ALBA, the social workers also travel to other countries to help implement energy saving programs –- such as in Haiti where they visited over 93,000 houses and installed more than 2 million energy efficient light bulbs. Similar to Cuba’s medical program, which has more than 20,000 doctors working abroad to help with health crises, the social workers are travelling around the world to help in the energy crisis. Fidel Castro, who founded the program, refers to the social workers as "Doctors of the Soul". "We need a global energy revolution", says Mario Alberto Arrastia Avila, an energy expert with Cubaenergia, an energy information centre in Cuba. "But in order for this to happen we also need a revolution in consciousness. Cuba has undertaken its own path towards a new energy paradigm, applying concepts like distributed generation, efficiency, education, energy solidarity and the gradual solarisation of the country." The rest of the world should follow Cuba's lead, for only a true global energy revolution will allow us to seriously confront the dire environmental problems that the world now faces. Laurie Guevara-Stone is the international program manager at Solar Energy International, based in Colorado, USA. Email: laurie@solarenergy.org. This article first appeared in the March-April 2009 issue of Renewable Energy World and has been reproduced in CubaSí with the author's permission.